alaTest has collected and analyzed 41 reviews of HP 15-bw068sa 15.6" Laptop - White. The average rating for this product is 3.4/5, compared to an average rating of 4.1/5 for other products in the same category for all reviews. Reviewers really like the size and keyboard. The design and portability are also appreciated. There are some mixed reviews about the sound and screen, and the durability and reliability get less positive views. We analyzed user and expert ratings, product age and more factors. 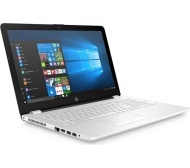 Compared to other products in the same category the HP 15-bw068sa 15.6" Laptop - White is awarded an overall alaScore™ of 86/100 = Very good quality. Love the sleek design & colour. It really makes you want to keep it clean. Took a while to get used to the extra spacing between the keys - as I've got small hands. But it was okay, when I got used to it. It's sleek, pretty and easy to use. Didn't realise it didn't have a cd/DVD drive. I know they are becoming obsolete but there are times when books I purchase include a cd...... Annoying as now will have to purchase a stand alone cd/DVD drive. Don’t buy this. V v noisy keypad and v v grumbly hard drive, turns itself off voluntarily. Heavy.